No separate life they never can know. Hannah More was well known in her day in at least three areas – as a writer, an educator, and a social reformer. It is sad that she has been all but forgotten in our day, but she deserves to be remembered as an example of charity, piety, and zeal in accomplishing great things in the service of the Savior. Early in her life she was well known for her play writing and her involvement with the “who’s who” members of the high society of the late eighteenth century. This included Samuel Johnson, Edmund Burke, and Horace Walpole. She wrote a popular play, Percy, which was produced by the famous actor, David Garrick in 1777. In later life, she became very active in helping to found Sunday Schools, especially for poor children and she practiced philanthropy. She was the most influential female member of the “Society of Effecting the Abolition of the African Slave Trade” in England. Hannah was born in Stapleton, near Bristol, in 1745. Her father was a schoolmaster. He saw to it that all five of his daughters were well educated. They would use their education in the service of the Lord; the three oldest founding a famous girls’ boarding school in Bristol. Hannah completed her education there. Her gift for writing would show up early. By age eighteen she had written a play, “A Search for Happiness”, which became widely read. 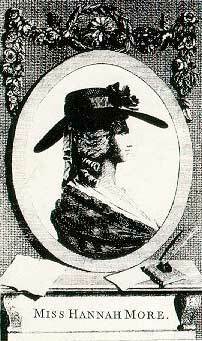 At 22 Hannah became engaged to a local landowner, William Turner. They were engaged for six years. He got cold feet twice after he and Hannah set the date. Finally after the third proposal, she ended the engagement. Turner tried to compensate her with a sum of £200 each year. She refused to take it, but her sisters accepted it without her knowing. Eventually, she agreed to use it, and this allowed her to give up teaching and concentrate on writing. When she was a young woman, Hannah enjoyed the high life. Sometime during the 1780’s she became more zealous for her faith, and eventually decided that the theatre was morally wrong. She began to believe that acting was not an activity that Christians should engage in. She turned to more Christian work. She now included among her friends John Wesley, who encouraged her in her Christian writing, Pastor John Newton, author of “Amazing Grace”, and William Wilberforce, famous for his work in the abolition movement. Wilberforce was a member of the “Clapham Sect”, a group of wealthy evangelical Christians who were fighting to get slavery abolished in England. Hannah’s Biblical worldview began to come out in all of her writings. She wrote many famous Christian essays on the importance of establishing moral laws in society. The most famous of her tracts, The Shepherd of Salisbury Plain, was written around 1795, and went through many editions. It was translated into several languages. In this and other tracts, she was encouraging commoners to be contented with their lot in life. 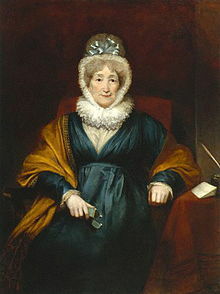 In 1809, she wrote, Coelebs in Search of a Wife, which was an essay on how to choose a good wife. This work went through thirty editions in the United States in ten years. Another important work was, Strictures on the Modern System of Female Education, which encouraged education for women. 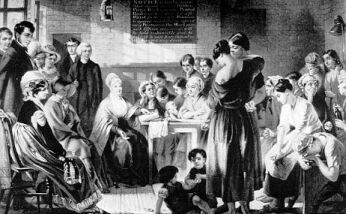 The Sunday School system was coming into popularity in the late eighteenth century. Hannah and her sisters established schools in the brutal coal district of Mendip Hills, known for very slovenly and dangerous neighborhoods. Within ten years, Hannah and her sisters had founded sixteen schools, helping the poor children learn to read the Bible and to practice Christian morals. The women also taught the children practical skills that would help them through life, such as cooking, growing food, and handling money. Hannah used her God-given writing ability to produce many of the books that were used in these Sunday Schools. Hannah continued to support the cause of abolition for the rest of her life. Even in her retirement years she played a part in the national debates on the slave trade by writing tracts against the practice. In her home in Somerset, she entertained such visitors as Macaulay and Gladstone, Samuel Taylor Coleridge, Elizabeth Fry (see her story in a February, 2012 posting on this Blog), and Sarah Siddons. Her influence was spread by many evangelical women who came after her, including well known novelists Mary Martha Sherwood (1775-1851) and Charlotte Elizabeth Tonna. Many hundreds of women carried on her work in Sunday Schools and Tract Societies. She had lived long enough to see her dream come true– the abolition of the slave trade in Britain. People came from all over the world to visit this bright, sweet old lady in her waning years. Towards the end of her life she suffered poor health. She had to limit these visits to two days a week, but she was always gracious and visitors left having been blessed by this remarkable lady. She died peacefully, on September 7, 1833, at the age of eighty-eight. Her charity did not stop with her death; she left behind nearly £30,000 (equivalent to $3,000,000 today) from the income from her books, to be distributed to the poor. Hannah’s life was an expression of a vital Christianity. She put her faith into action, combining faith, hope, and charity to all downtrodden people. She has been called an “Apostle to the Poor” and truly she was. She believed that “Faith without works is dead”, and summed up her theology for life when she wrote, “Action is the life of virtue, and the world is the theatre of action.” I pray that Christian women today would be more active in righting wrongs and fighting for justice for the poor or downtrodden. “Consider it all joy my brethren, when you encounter various trials, knowing that the testing of your faith produces endurance” (James 1:3). Yarn, the shuttle, threads of the loom, and baskets. And the cheerful choral dances of double-crested Parnassus. Perhaps other women are pleased with other things. But these are my glory, and these are my joy. 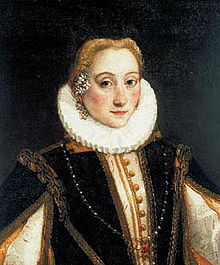 Olympia Morata (1526 – 1555) composed these lines while she was in her early teens. She was a remarkable woman, who lived a brief life, but left behind a heroic story that is still remembered by many today. Olympia led an unusual life that started out with riches and ease, but later was filled with trials and difficulties. She was brought up in very good circumstances. Her early years were spent at the court of Duke Ercole II and Duchess Renee of France. (I have already posted a story on Renee of France elsewhere on this blog.) In 1528, Duke Ercole, married Renee of France, sister-in-law of the French king, Francis I. Renee brought with her to the Este court her views on religious reform which were influenced by Luther and Calvin. These views were not popular with the Duke, her husband. He tolerated Renee’s religion and her advisors and visitors as long as he did not have any conflicts. Later, for political reasons, and to appease the pope, he would send Renee’s friends away, and even imprison her for awhile to win favor with the Roman pontiff. Olympia’s father, Fulvio Morato, shared Renee’s religious views, and in 1532 was one of those forced to leave Ferrara. For six years his family lived in other northern cities, where he lectured on the teachings of Luther and Calvin. During this time Fulvio, a widely recognized university professor, was aware of how gifted his daughter was and saw to her education. Olympia was fluent in Latin and Greek by the time she was 12. By age 13, she had already developed into a scholar in her own right, lecturing on Cicero and studying philosophy. She was well known for her poetry, which included her own metrical adaptations of the Psalms. In 1539, when the Duke was more tolerant again, Fulvio was invited back to court. Word of his daughter’s brilliant scholarship reached the Duke and the Duchess, and Olympia was invited to tutor their eldest daughter, Anna D’Este. For seven years she lived the exciting life of a courtier, tutoring Anne, writing, and doing all the things expected of a brilliant scholar. She was, she said later, “exalted to the skies.” You can see her joy in her life in the poem printed above. We should be careful not to take these words out of the context of her cultural circumstances. Olympia was not objecting to any perceived inequality between the sexes. She was a young woman who loved her father and was pleased to work hard at the gifts that God gave her. She was thankful to God because He “gave me a mind and a talent to be so aflame for my studies that no one can divert me from them.” Like true scholars, it was her chief joy in life. Later, she would rise to the occasion, and do the work normally expected of women when it was needed. In 1547, her father became ill and she went home to nurse him. He died the following year, and Olympia returned to court. But she found that Anne D’Este had married Francis de Guise and moved to France. Olympia’s services were no longer needed. Also at this time, the Duke had decided to persecute those of the Reformed religion to please the pope, and most of Renee’s advisors and friends were banished from court. Olympia returned home. Fortunately, her father had saved some money and her family, though poor, was not in dire circumstances. Though she never thought she would marry, she changed her mind when Andreas Grunthler, a German protestant who came to Ferrara to study medicine, proposed marriage. Olympia had met him before when he came to visit her father. She did not realize how interested Andreas was in her. She was pleased to accept his offer and they were married in 1549. Shortly after this, they made the decision to move in order to avoid the Roman inquisition. Many followers of the reformed religion tried to stay in their home towns and hope for change. At this time in history, the pope was very strong and had many allies and large armies. Thousands of reformers were killed or forced to flee. Andreas and Olympia decided to leave rather than take a chance and moved to Schweinfurt, Germany. They took her young brother, Emilio, with them. Andreas accepted a position as a medical doctor for the Imperial Spanish troops who were stationed nearby. In 1553-54, he and Olympia were caught in the middle of war. They were trapped in the siege of Schweinfurt, in Franconia for nine months. There was killing outside and inside the walls. Anyone trying to leave was shot. But to stay within the city meant facing death when the plague came. It killed half the population and nearly claimed Andreas’ life as well. 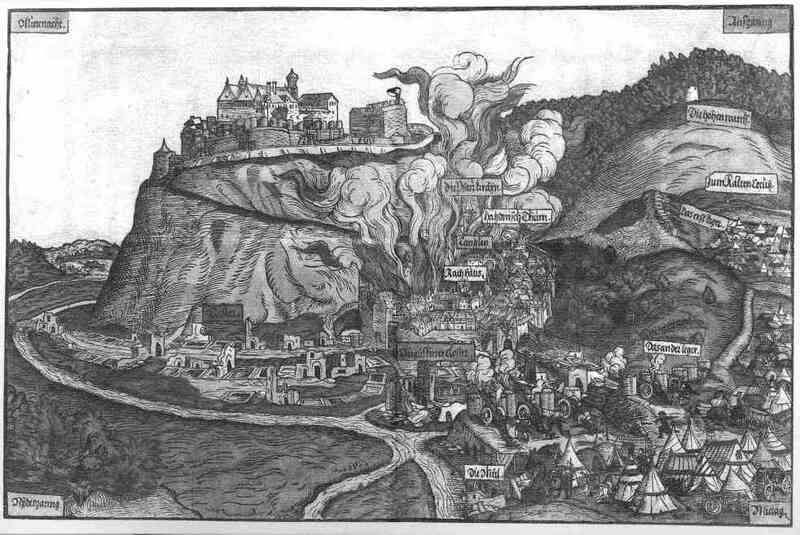 Eventually, the city was seized and burned to the ground. Olympia, Andreas, and Emilio left with less than the clothes on their backs. Some of the soldiers who were sacking the city offered to let them go and not kill them in exchange for their clothing. They made a miraculous escape, nearly losing Andreas in the process. Most of Olympia’s writings were lost in the fire. But some of her friends gathered up all they could find and in 1558 one of them, Celio Curio, published the first edition of her work, along with letters to her from others and some of her poems; other items were found and added in later editions. In time, Andreas, Olympia, and Emilio went to Heidelberg (1554) where Andreas was to be a professor of medicine. Olympia tutored students in Greek and Latin. Olympia was very ill after they fled from Schweinfurt and within two years, she was dead. Within two years after that Andreas and her brother died, all from the ravages of the siege, famine, and plague. All three are buried in the Chapel of St. Peter at Heidelberg. Olympia was grateful for her testing. We pray that we won’t ever have to undergo the dangers and near-misses with death that she did. But we shouldn’t pray for God to spare us from all challenges and trials. It is God’s means of maturing us. And to be with Him in whom my life thrives. He bowed His ear down from above. And banished thence my doubts and fears. Anne Bradstreet lived in a time when women received little education and were supposed to stay at home attending to husband and family, but she met the challenge of living a Godly life, submitting to the religious culture of her time, while following her heart. During these really tough times in early Puritan America, life was full of hardships and danger. But Anne was a strong woman, and was willing to give up much including sleep or what little leisure time she had to fulfill her desire to write poetry. Anne Bradstreet was born to Thomas and Dorothy Dudley in 1612. Both of her parents were in upper class society and were very wealthy. Thomas Dudley was the steward to the Earl of Lincoln. Anne was a brilliant child and her father delighted in educating her. When she was seven years old, tutors were hired to teach her dancing, music, and many other subjects. She had unlimited access to the great library at the estate of the Earl. She became exposed to the writings of many famous authors. Besides English, she was tutored in history and literature in Greek. Latin, French, and Hebrew. In 1628, at the age of sixteen, Anne married Simon Bradstreet, the son of a Puritan minister and her father’s assistant. The following year, her father and husband decided that they wanted to join others who would leave for America so that they could worship God as they believed. 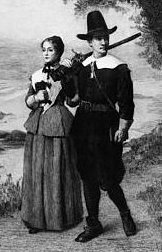 They wanted to protect Puritan values and establish their own society in a new land. The Bradstreet’s were not happy about leaving most of their wealth behind, but they were willing to trade that for more religious freedom. On March 29, 1630, Anne and her family immigrated to the New World. They spent three months on the ship, the “Arbella”, reaching Salem, Massachusetts on June 12, 1630. Ten other ships reached the port soon after that. It was an arduous journey and several people died on the way. When Anne stepped on shore of the new land, she found sickness, lack of food, and primitive living conditions. Many died from the cold and starvation. Some would turn around and go back to England. Anne did not get bitter or discouraged. She did not give in, but instead tried to make the best of her new life. She struggled to raise her eight children and take care of her home, often without her husband’s help. He was influential in government and was absent on business many times. Instead of fretting and complaining, Anne turned to the comfort of her writing. There were many who criticized her for this, since writing was not considered a seemly thing for women to do. Women were often considered intellectual inferiors and because of this some believed that Anne stole her ideas for her poems from men. Because she was a woman, her poetry was often judged by a different standard. It seems that her brother-in-law, John Woodbridge, believed in her work however. He took some of her early poems, without her permission, back to England and had them published there. Entitled, “The Tenth Muse Lately Sprung Up in America, OR Severall Poems, By a Gentle Woman in Those Parts”, it was a milestone in English and American literature. 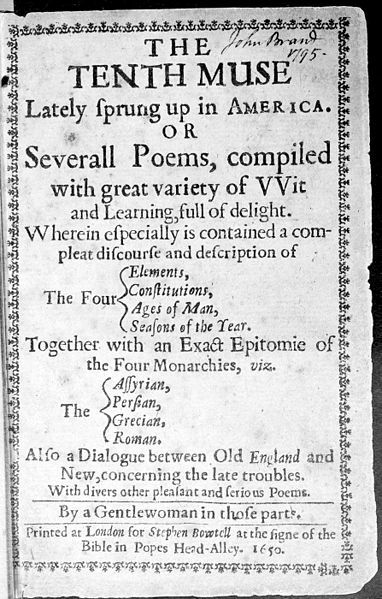 It contained the first verses by an American that could stand alongside England’s poetry. It was the first volume of enduring English-language poetry produced by a woman. The poems in the book were lengthy, poetic treatments of learned subjects, such as the epochs of history and the seasons. They were scholarly in nature and written in a style that would be expected more from a poet in a European court than from woman in the backward colonies. The book was well received in England and America. A century later, John Newton, the famous hymn writer who penned “Amazing Grace”, praised Anne Bradstreet’s works. Later on in her life, Anne turned from this formal style of writing to include more of her emotions. She wrote of such things as her love for her husband and children and the Lord. She would write of momentous events in her life, such as the birth of her children, or the happiness she felt when her busy husband would return home. She also wrote about the times that there were hardships. One of her most famous poems was written after their house burned. She turned her focus on God and His bounteous goodness and love for her. Anne seemed to be a very unusual woman for her time, but she took herself very seriously as an intellectual and as a poet. She continued to read widely and study the works of other famous poets. She gradually developed her own unique style that was original for its time. In spite of the complexities of Anne’s character, she was still a devout Puritan. Her love for God shows in her poetry. Yet at times she was frustrated by the prevailing male hierarchical attitude of the day. She knew that any woman who tried to use her wit, charm, or intelligence in the community found herself ridiculed, banished, or executed by the Colony’s powerful group of male leaders. Her friend, Anne Hutchinson was also an intelligent, educated, and deeply religious person. Anne Hutchinson held prayer meetings in her home. The things that she was teaching would not be considered heretical today, but she was condemned as a heretic by the male leaders and banished from her home. Later Anne Hutchinson would be killed in an Indian attack in New York. No wonder Anne Bradstreet did not want her poems published! She looked at what happened to her friend and decided to remain silent, only showing her poetry to family and close friends. Upon this rock Christ Jesus will I build by faith, and if I perish, I perish. But I know all the powers of Hell shall never prevail against it, I know whom I have trusted, and whom I have believed and that he is able to keep what I have committed to his charge. Anne Bradstreet’s story is one of faith and courage. She lived in obedience to the tenets of her time, but she did not let the criticism of others stop her from using the gifts God gave her. She is a model of the Christian woman who must walk the fine line between standing up for what is right without being offensive to those around her. I pray that God would give all of us the wisdom and courage to serve Him in the way He has called us. One of the really great women of courage, compassion, and determination was Elizabeth Gurney Fry. Most people remember her chiefly for the prison reforms that she helped bring about in the nineteenth century in England. But, Elizabeth went beyond her work at Newgate prison and became active in reform for mental asylums, the convict ship system, nursing standards, education for working women, better housing for the poor including hostels for the homeless, and she founded soup kitchens. She did all of this on top of being an active and devoted mother of eleven children, Bible teacher for the children in her neighborhood, and a sometime minister in her local Quaker congregation. There is so much to admire about this woman, but in this essay I would like to focus on her work in the prisons. How was she able to accomplish so much? Elizabeth had been born the third child out of twelve in a Quaker (Society of Friends) family, in 1780. Her parents, John and Catherine Gurney, believed that girls as well as boys should receive a thorough education including all of the major academic subjects. Catherine herself taught the children these as well as the Bible and she sang the Psalms with them. She spent a lot of time visiting the poor and sick in her neighborhood and Elizabeth would often go with her when she made her rounds. Catherine died after giving birth to her twelfth child and Elizabeth was deeply grieved. She helped raise her younger siblings. Elizabeth’s upbringing prepared her for what came later in her life. As a young girl, however, she was somewhat rebellious and often made excuses to get out of church services. She was not very serious about religion, but one night on February 4,1798, a Quaker speaker, William Savery, touched her heart. This vain girl who had attended the meeting in purple boots with scarlet laces later said, “I think my feelings that night…were the most exalted I remember…suddenly my mind felt clothed with light, as with a garment and I felt silenced before God; I cried with the heavenly feeling of humility and repentance.” She said that she began to really believe that there was a God. After this, she became less interested in frivolous amusements and tried to live in a more serious manner. She adopted the ways of the plain Friends and even started a Sunday School in her home. She followed in her mother’s footsteps feeding the poor, providing clothes, and reading the Scriptures to them. About a year later she met Joseph Fry, a banker, and they married in 1799. They would eventually have eleven children. She met the demands of motherhood combined with her work with the poor in her neighborhood, though she often wondered if God had more for her. Then in 1813, a visiting Quaker minister from America, Stephen Grellet, came to ask for her help. He had been visiting in the prisons and was horrified at what he saw, especially in Newgate prison. Hundreds of women and their children were crowded into just two cells in the prison. They were sleeping on the floor without nightclothes or bedding in many cases. When Grellet told Elizabeth about the way the women were treated in Newgate, she decided that she must visit the prison. The next day, she and her sister-in-law went to Newgate prison. The turnkeys (guards) warned them that the women were wild and savage, and they would be in physical danger. However, they went in anyway. On that and further visits, they brought warm clothing and clean straw for the sick to lie on. Elizabeth prayed for the prisoners and began reading the Bible to them. It is important to remember that the prisons then were very different than the prisons now, especially in the United States. If you have read “David Copperfield” by Charles Dickens, you got a pretty good picture of the conditions for the poor in England in the early nineteenth century. It seems unreal to us now, but debtors could be thrown into prison and were allowed to take their wives and children with them. The entire system in England was corrupt at that time. It was not unheard of for a person to be acquitted, but unable to get out because they could not pay the jailer’s fees, which were often no more than a bribe. There was a death penalty for theft. Prisoners were often transported out of the country to America or Australia. The convict ships were appalling. At Newgate, where Elizabeth visited, some of the women had been found guilty of various crimes, but others were still waiting to be tried. They did not have warm clothing. The women had to cook, wash and sleep in the same cell. Afterwards Elizabeth wrote that the “swearing, gaming, fighting, singing and dancing were too bad to be described”. Elizabeth began to visit the women prisoners on a regular basis. She actually spent the night several times in some of the prisons and invited the wealthy nobility to come and stay and see for themselves the conditions prisoners lived in. In 1817, Elizabeth organized a group of women into the Association for the Improvement of the Female Prisoners in Newgate. This group organized a school, and provided materials so the prisoners could sew, knit and make goods for sale. They took turns visiting the prison and reading the Bible to the prisoners. Her kindness helped her gain the friendship of the prisoners and they began to try to improve their conditions for themselves. On the night before a convict ship was supposed to leave for the Colonies, there would often be a riot. The women resisted being thrown on the ships because it was well known that women would be sick and even die on the voyage. When they got to Australia, they would have nothing and would most often turn to prostitution just to be able to live. Elizabeth set out to change this situation. For more than 25 years, she visited every convict ship leaving for Australia, and promoted reform of the convict ship system. She saw to it that the women had cloth and sewing materials to make clothing for their own use or to sell when they disembarked so they would not be entirely destitute. There is much more that could be said about Elizabeth Fry. She was so well known and respected in her own time that her work even received support from Queen Victoria. The Queen took a close interest in her work and the two women met several times. Victoria gave her money to help with her charitable work. In her journal, Victoria wrote that she considered Elizabeth Fry a “very superior person”. Elizabeth continued her work in prison reform, nurses training, and societies for the poor until her death. She died on October 12,1845 after a short illness. At this point, we might wonder, “How in today’s society with so much bureaucracy can we help women in prison?” Things have really changed. You can’t just go in to a prison today like Elizabeth could in her day, though you would be a lot safer. I would like to say that though the obstacles are different, the challenge is the same. Jesus told the disciples in the Gospel of Matthew that those who would follow Him should visit people in prison. We are to care for the poor, the sick, and the prisoners. (see Matthew 25:41-46). 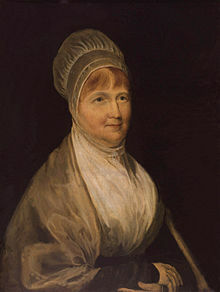 If Elizabeth Fry, devout wife, churchgoer, mother of eleven, and founder of many organizations, could do it in the early 1800’s, with no car, welfare subsidies, protection from guards, or political backing, then we surely ought to be able to accomplish some good. I also admit that she was not distracted by television, social clubs, modern beliefs on individualism, emphases on our “personal space”, or political correctness. We have our own challenges. Our advantages include modern technology, protection in the prisons, a lot of free time compared to generations ago, and many organizations that are already helping. One such is “Prison Fellowship”. There are many good prison outreaches, but PF is a good place to start. They not only have programs for visiting men and women in prison, but many programs for helping on the outside. Whether you have several hours a month to give or several minutes, there are many ways to help. One that is fun as well as rewarding is the “Angel Tree” program, where gifts are collected for the children of inmates to be given to them at Christmas time. Thank heavens the families of prisoners are no longer thrown in jail with them. Yet they suffer, especially the children. I urge you to consider the amazing life of Elizabeth Fry. I hope her energy and zeal make you feel guilty enough to at least pray for those in prison. Her life story of compassion has been an inspiration to many.